House Telvanni is one of the Great Houses of Morrowind. It governs the Telvanni District of eastern Morrowind from the island city of Port Telvannis, and administers the eastern portion of the Vvardenfell District from its council seat in Sadrith Mora. The house comprises mainly highly egocentric and ambitious mages, and is known to many as the house of the master wizard. Here, it is common to rise through the ranks by eliminating or otherwise 'indisposing' other members. Of the Telvanni lords, only Master Aryon of Tel Vos - the youngest and newest councilor - seems able to look beyond the end of his own nose and at the concerns of other people; the rest want little more than to be left alone to their research and ambitions. The other members are similarly isolationist in outlook and do not intend to be presided over by any of the other institutions, predominantly the Guild of Mages. The Telvanni, in general, do not interact with other Houses or Guilds, nor do they have many enemies save for Abolitionists and the Imperial Mages Guild. In the Second Era, they refused to join the Ebonheart Pact, much to the chagrin of the other houses. On the other hand, the Telvanni do not have the usual hatred of vampires that most other factions have, and some of their lords and Mouths are willing to speak to them; wizards do not fear vampires nearly as much as others do. The House Telvanni is mostly structureless. Once a person is kin to the House, they advance through the service of a particular great Wizard. Individuals of the rank of Wizard or above achieve their rank through the exertion of power and authority, and not through any official recognition. The House does not do anything, it has no center of gravity. Port Telvannis and Sadrith Mora are the only real cities of the Telvanni, and Sadrith Mora only exists to treat with the Imperials at Wolverine Hall. Port Telvannis is a sprawling web of sadrith monstrosities. Port Telvannis was the original home of the Telvanni, until they needed to get away from each other for their own protection, and began building sadrith towers elsewhere. Port Telvannis remains the hub of what little "house activity" exists, including the Parliament of Bugs, and in order to enter it, a person must be marked with void salts at Gah Sadrith by the ferrymen-warders (an unpleasant business). To join the Mainland House Telvanni, you must speak with Vero Renim in the Telvanni Council House in Port Telvannis. It should be noted that House Telvanni is the only house in Morrowind to tolerate vampires and even let them join their ranks. If you are expelled, you must speak with Vero Renim in Port Telvannis to make amends by paying 500 gold (See Notes). You can repeat this as many times as needed. 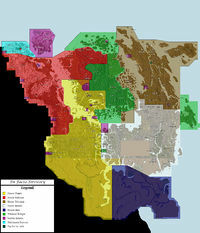 *Both Mainland and Vvardenfell Factions. Ingredients for Lord Dral: Collect some ingredients for the study of the Archmagister. Uncharted Waters: Explore a new magical world, and adapt to its conditions. Dispatch to Eldale: Bring a message to Mistress Eldale in Gah Sadrith. Message to Bal Gernak: Bal Gernak receives a warning to stop his actions, and you should bring it. Seeds for Faruna: Bring some precious plant seeds to Mistress Faruna in Tel Oren. Fresh Delivery: Gather some research subjects from the slavemarket in Port Telvannis. Census in Ranyon-ruhn: Find out why the census in Ranyon-ruhn has stopped. Peacemaker: Solve a dispute between the local priest and another citizen of Ranyon-ruhn. To Catch a Spy: Discover and eliminate the spy of the Mages Guild. A Warning in Firewatch: Save the cover of Vaneris Theneria. A Message from Vvardenfell: Meet a messenger from Vvardenfell in Bahrammu. Plague: Areth Morvayn wants you to supply an agent of Mistress Eldale, or does he? Fools that Meddle: Remove a priest from Port Telvannis to please Master Vaerin. When making amends with Vero Renim after being expelled, he will ask for 500 gold, but only 75 gold will be removed from your inventory. This page was last modified on 6 March 2019, at 08:05.